Wacheya! Shannon Monk Payne is the founder and CEO of Sakatay Global and creator of the Indigenous Circle Approach to Cultural Confidence™. Her professional background is in education, working primarily with First Nations. She has worked both on reserve and off reserve in a variety of classroom-based, culture-based and policy-based positions, including at the Assembly of First Nations for six years. She is of Mi’kmaq and European descent, and a member of St. Theresa Point First Nation, an Oji-Cree fly-in community in northern Manitoba. Shannon’s academic accreditation includes a bachelor of arts in native studies and a bachelor of education from Brandon University as well as a professional master’s in public administration with a focus on Indigenous policy and governance from Queen’s University. 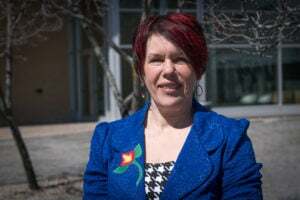 Since 2015, Shannon has worked as a consultant and been the lead on a number of national projects to advance Indigenous education and reconciliation. Shannon has four children and two grandchildren. Her passion for education and reconciliation stems from a strong desire to create the best future possible for the next generations to come. Shannon’s favourite thing about Canada is the shift that is taking place with Canadians about Indigenous issues. It is exciting to be on the cusp of change. There is a cultural revival that is happening with Indigenous youth and a desire to stand strong and proud in their culture and identity that is being encouraged and supported across the land. There is a growing understanding with Canadians that supporting families and communities by closing the equity gaps for Indigenous peoples in Canada opens the doors to prosperity and well-being for all citizens. Eh ha! Yay!